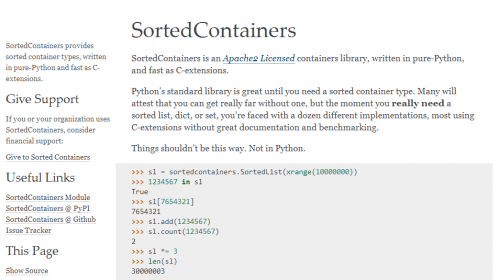 Python SortedContainers module is an Apache2 licensed containers library, written in pure-Python, and fast as C-extensions. Note: don’t try this at home without at least a gigabyte of memory. In Python an integer requires at least 12 bytes. SortedList will add about 4 bytes per object stored in the container. That’s pretty hard to beat as it’s the cost of a pointer to each object. It’s also 66% less overhead than a typical binary tree implementation for which every node must also store two pointers to children nodes. Python SortedContainers takes all of the work out of Python sorted types – making your deployment and use of Python easy. There’s no need to install a C compiler or pre-build and distribute custom extensions. Performance is a feature and testing has 100% coverage with unit tests and hours of stress. Kenneth Reitz – Thanks for your samplemod project and for creating a beautiful API with requests. Your encouragement in various blog posts about contributing to open-source inspired me to try giving back to Python. Armin Ronacher – Thanks for your many contributions to open-source. In particular thanks for Flask and the beautiful template for documentation. Daniel Stutzbach – Thanks for blist which became my API reference for implementing the list, dict, and set types. I also want to thank the rbtree, treap, bintrees, and skiplistcollections developers for performance comparisons. Complete documentation including performance comparisons is available at http://www.grantjenks.com/docs/sortedcontainers/. Check for open issues or open a fresh issue to start a discussion around a bug. There is a Contributor Friendly tag for issues that should be used by people who are not very familiar with the codebase yet.